Everything about acne today will indeed cause the psychological impact on everyone because it will lower their confidence. Well, maybe we've done various ways to prevent acne, but because there are so many causes that can triggering acne, it is very difficult to prevent it. If acne is already adorn the skin, then it takes a way to overcome them. Acne treatment with herbal ingredients is certainly a solution that you should do considering herbal ingredients are very easy to find, easy to apply, and most importantly safe for the skin and does not cause harmful side effects (except for some people who has specific allergy). Well, what are some herbal ingredients to get rid of acne quickly? In this article you will get the information. Before you know a variety of herbal remedies to get rid of acne, it's good if you first find out the various causes of acne. Here are some of the main factors that cause acne. Bacteria. The main factors causing acne can be bacteria. Acne-causing bacteria such as P.acnes can cause acne inflammation in a short time. For that, extra care is needed so that these bacteria do not cause acne on your skin. Genetic. Genetic factors are also a major cause of acne. When you have a history of parents who have oily skin types and acne, then of course you will most likely have the same skin type. Oily skin types will be more susceptible in acne because excess oil can clog pores. Therefore, it is better to do acne and oily skin care naturally. Hormone. Unbalanced hormones entering the pube phase or menstrual phase can also cause acne. This is because the types of hormones that cause acne such as androgens that are unbalanced will trigger excess sebum production, and can clog the pores of the skin causing the characteristics of acne due to hormones. Less Keeping Skin Care. Your lack of attention to skin hygiene will certainly cause acne. If you rarely wash your skin or clean the skin regularly, then dust, dirt, and pollutants that stick to the skin will clog your pores and your skin will of course be decorated by acne. Once you know some of the main factors causing acne, it is time you know the various kinds of acne herbal remedies that can get rid of acne in quick time. Curious what are these herbal remedies? Here's the review for you. 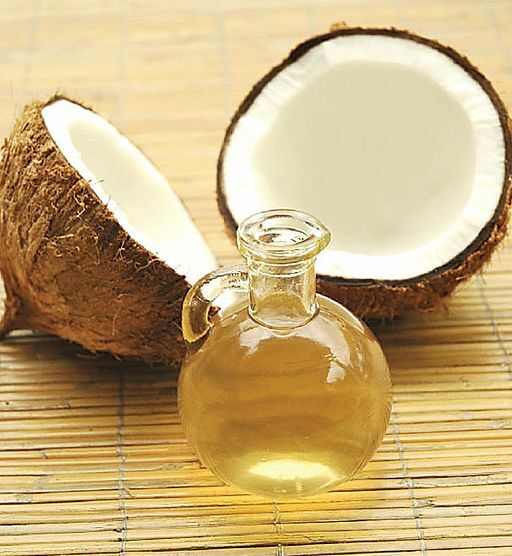 Other than used for cooking ingredients, Coconut oil can also be very useful to overcome acne on the skin. Here are the benefits of coconut oil to overcome acne in your skin. Lauric acid in coconut oil can act as an anti-bacterial and anti-viral that can kill acne-causing bacteria in an instant. Coconut oil can accelerate the healing process of the wound, so that active acne on the skin will be more quickly dry and deflated, and this natural oil can be used as a way to remove black stains acne scars. Using a finger or a cotton bud, drop a few drops of coconut oil. Apply a cotton bud or finger that contains coconut oil to the skin contained acne. Let stand for 10 minutes. Then wash the skin with clean water and dry it immediately. For maximum results, use this coconut oil regularly every day. Lemon has vitamin C that triggers the production of collagen where this collagen will smooth the skin and accelerate the healing process of acne. Lemon has anti-bacterial and anti-microbial properties that will kill acne-causing bacteria and prevent acne breakouts later in life. Prepare 1 lemon, take the juice and apply to the skin contained acne. Let stand for 20 minutes, then wash the skin with clean water and dry it immediately. For maximum results, use this lemon every day on a regular basis. Potato is one source of carbohydrates that have many benefits to eliminate acne. Here's the review for you. Potatoes can trigger the production of collagen where the benefits of collagen for acne is to accelerate the process of acne healing because collagen is a protein that is needed by skin. Potatoes contain vitamin C that will ward off free radicals cause acne and can reduce acne in a short time. So no wonder if the potatoes can be used as an acne treatment quickly. Prepare 1 piece of potato, peel the skin, and mash the potato until it becomes smooth. Add a few drops of water if necessary. Apply potatoes to the area of skin that contain acne. Let stand for 20 minutes. Wash your skin with clean water and dry it immediately. For maximum results, use this potato mask once every day. Garlic is usually used as a complementary flavor of cooking, this herb actually has a remarkable ability to eliminate acne. Here are the benefits of garlic for acne and how to get rid of acne with garlic. Garlic contains a compound thiacremonon that will dry and quickly spray acne. Garlic has many ingredients that is an anti-bacterial, anti-fungal, anti-microbial, and natural antiseptic properties, which will kill various acne-causing factors. Prepare 3-4 cloves of garlic, then finely crushed, and add a few drops of water. Mix well. Apply a garlic mask to the acne skin area. Let stand a few moments, about 10 minutes. Wash the skin with water on the berish and dry it immediately. Do not forget to use a moisturizer after the use of garlic. Use a garlic mask once a day on a regular basis. Olive oil is also a natural ingredient that has a high level of efficacy to get rid of acne. Here's a review of the benefits of olive oil and how to get rid of acne with olive oil for you. Olive oil has anti-bacterial properties that can kill acne-causing bacteria. Olive oil has anti-inflammatory properties that will reduce swelling and redness effects on acne quickly. Put a few drops of olive oil onto your index finger. Apply olive oil droplets to areas of acne prone skin with massage movements. Let stand for 5 minutes, then wash the skin with clean water and dry it immediately. Repeat the above for 3 times a week. Avocado is a fruit that has good fats and is also useful to overcome the problem of acne. Here's the review for you. Avocado is rich in vitamin E which is a source of natural antioxidants and can ward off free radicals and prevent acne inflammation. So no wonder if the avocado can be used as a way to reduce acne inflamed quickly. Vitamin C and K on avocado will be very useful to kill the bacteria that cause acne. Prepare 1 avocado, then take the meat and smash it. Apply the avocado to the acne prone skin. Let stand for 15-20 minutes, then wash with clean water and dry it immediately. Use an avocado mask once a day on a regular basis for maximum results. Salt that is a seasoning food, this seasoning can be very useful to prevent and overcome acne. Here's a review of the benefits of salt for acne and how to get rid of acne with salt for you. Salt can suppress sebum production, so the occurrence of acne due to excess oil can be minimized. Salt can kills bacteria that cause acne thanks to anti-bacterial properties as well as various minerals contained in it. Mix 1 teaspoon salt with 1 teaspoon of clean water, then stir until evenly distributed. Apply your skin acne with salt mask, let stand for 10 minutes only. Wash skin using clean water and dry it immediately. Use a moisturizer after the use of salt. For maximum results, use this salt once a day on a regular basis. esides being used as a seasoning food, Apple vinegar also has many benefits to overcome acne. Curious? The following benefits of vinegar to overcome acne. Apple vinegar has anti-bacterial and anti-microbial properties, so it can kill acne-causing bacteria instantly, so the bacteria that cause acne stone will not harm your skin. Apple vinegar contains alpha-hydroxy acid that will remove dead skin cells and refresh your skin. Combine apple vinegar and clean water in the same dose ratio. Mix well. Apply the apple vinegar mask to the acne skin area. Leave it all night. In the morning, wash your skin with clean water and dry it immediately. For maximum results, apply an apple vinegar mask on a regular basis. Baking soda is usually used as a cake ingredrient, but it also can be used to overcome the problem of acne. Here's a review of the benefits of baking soda and how to get rid of acne with baking soda for you. Baking soda can trigger the production of collagen in the skin, which of course will smooth the skin and accelerate the process of acne removing. Baking soda has anti-inflammatory properties, which will reduce swelling and redness effects on inflamed acne in a short time. Combine 2 teaspoons of baking soda with 1 teaspoon of water, then stir until evenly distributed. Apply a baking soda mask to the acne skin area. Allow to dry for 5-10 minutes. Wash your skin with clean water and dry it immediately. For maximum results, use this baking soda every day on a regular basis. Green tea is knnown has various benefits for the body, including to treating acne problems in the skin. Here's the review for you. Green tea is claimed to have a level of efficacy to kill acne-causing bacteria by up to 50% more effective than benzoyl peroxide, which is the main ingredient in acne scar prevention cream in pharmacies. Green tea has an antioxidant called catechin that can ward off free radicals and prevent and treat inflammatory acne. To take advantage of green tea, you can instantly consume it directly in exactly the same way as when you make regular tea. For maximum results, it is recommended to consume 4 cups of green tea per day. This one herbal plant is already widely known to cure various internal diseases. However, did you know that Betel Leaf can overcome acne? The following benefits of betel leaf for acne stone and how to get rid of acne with betel leaf. Betel leaf contains high vitamin C that ward off free radicals cause acne and trigger the production of collagen that can smooth the skin. Betel leaf contains chevicol and betlephenol that will act as an anti-bacteria compounds and kill acne-causing bacteria instantly. Prepare 5 pieces of betel leaf, boil the leaves with 3 cups water. Immediately after the water was boiled, then turn off the heat, and chill the betel leaf solution for a while. After that, you can apply the water of betel leaf to the acne skin. Let it stand for 20 minutes. Wash the skin with clean water and dry it immediately. For maximum results, use a betel leaf mask 3 times a week. This herbal acne medicines plant is already widely known for its benefits to improve the health of the body, not to mention skin problems such as acne. Here are the benefits of aloe vera for acne and how to get rid of acne with aloe vera. Aloe vera has anti-inflammatory properties that will cure inflamed acne and also red pimples. Aloe vera contains giberelin hormone that can kill bacteria that cause acne and trigger the growth of new skin cells. Prepare aloe vera plant, cut the tip until you see the gel inside the plant. Apply aloe vera gel to the affected skin area of acne. Let stand until dry. Wash skin with clean water and dry it immediately. For maximum results, use this aloe vera daily on a regular basis. Honey is a natural antibiotic that has properties to kill acne-causing bacteria. The nature of honey acid is able to inhibit bacterial growth and contains anti-inflammatory properties that will cure acne inflammation quickly. Prepare pure honey, then apply to your skin contained acne. It will be better apply it at night before you sleep. In the morning, wash your skin and dry it immediately. For maximum results, you can use a honey mask once a day every night on a regular basis. Tea tree oil is a natural ingredient that also has various benefits to overcome the problem of acne. Curious? The following benefits tea tree oil to overcome acne. Tea tree oil has a 4-ol terpinent content that acts as an anti-microbial so it can kill acne-causing bacteria quickly. Tea tree oil can neutralize the pH of the skin so it will avoid the occurrence of acne due to bacteria and various other contaminants. So no wonder if tea tree oil is often used as a way to prevent acne naturally. Use a cotton bud, drop a few drops of tea tree oil. Apply a cotton bud containing tea tree oil to the area of skin contained acne. Leave it all night. In the morning, wash the skin by using clean water and dry it immediately. Repeat the above steps regularly every day. Papaya can not be denied is one of the most delicious fruits to be consumed directly. Well, papaya apparently has many benefits for acne. Here are the benefits of papaya for facial acne for you. Papaya contains papain compounds that can act as an anti-bacterial agent that will kill acne-causing bacteria in an instant. Papaya contains beta carotene which will trigger the growth of new cells to replace damaged skin cells. The result, the skin will become free from acne. Prepare papaya flesh, then puree in a blender or mash it manually until it smooth like pasta. Apply a fine papaya mask to the area of acne prone skin. Let stand for 20-30 minutes. Wash the skin using clean water and dry it immediately. For maximum results, use this papaya regularly once a day. Maybe during this time you often remove the banana skin after finished consuming the fruit. Well, better take advantage of banana skin to overcome the problem of acne. Here are the benefits of banana skin for acne. Banana peels contain high levels of Vitamin A, B, C, and E, whereby these vitamins will nourish your skin as a whole, so it can be used as a way to treat your face to avoid acne. Lutein compounds in the banana skin will act as an antioxidant as well as killing the bacteria that cause acne. So no wonder if the banana skin can be used as a way to get rid of acne small. Prepare the banana skin, then apply the inside of the banana skin to the acne skin area. Let stand for approximately 30 minutes, then wash the skin with clean water and dry it immediately. Repeat the above steps 2-3 times a day on a regular basis. In addition to egg white and lemon, lime is also an ingredient for herbal remedies that are very powerful to treat acne. Here are the benefits of lime for acne on your skin and how to get rid of acne with lemon. Lime is very high vitamin C, so it can trigger the production of collagen that will smooth the skin and accelerate acne healing. Lime contains citric acid which will lift dead skin cells and brighten your facial skin. Prepare 2 pieces of lime, then squeeze the water and mix it with clean water. Apply the lemon mask to the area of skin that contain acne. Let stand for 30 minutes. Wash your skin clean and dry immediately. For maximum results, use this lemon once a day on a regular basis. Tomatoes in addition to being used as fresh vegetables in various foods, can also overcome various kinds of acne problems in your skin. Here are the benefits of tomato mask for acne face and how to get rid of acne with tomatoes. Tomatoes can balance the pH of the skin so it will avoid acne due to irritation of acne-causing bacteria and various other contaminants. Tomatoes contain vitamins A, C, E, K, B1, B2, B3, and B6 that can shrink pore size and also nourish the skin as a whole. Prepare 1 tomato, then slice thinly into sections. Attach tomato slices to acne-prone areas. Let stand for approximately 1 hour, then wash the skin with clean water and dry it immediately. For maximum results, use a once-daily tomato mask on a regular basis. In addition to tomatoes, natural ingredients that are usually used as fresh vegetables but very useful to overcome acne are cucumber. Well, here are the benefits cucumber for acne and step how to make cucumber mask easily. Cucumber is able to tighten skin pores which of course will prevent new pimples appear in the future. Cucumber contains silica that will act as anti-bacterial and anti-aging early which of course will be useful to kill the bacteria that cause acne. Prepare 1 cucumber, then slice into pieces. Paste the cucumber slices into the acne-prone area of the skin. Let stand for approximately 1 hour. Wash skin using clean water and dry it immediately. For maximum results, use a cotton mask once a day. Turmeric is a traditional spice that can additionally be used to lavish various cuisines, can also be useful to overcome the problem of acne. Here are the benefits of turmeric for acne. Turmeric has anti-bacterial properties and a natural antiseptic that can kill acne-causing bacteria instantly. Curcumin compounds in turmeric have anti-inflammatory properties that will prevent and cure various inflammatory acne and red pimples. Prepare turmeric, mash until it becomes fine powder, then mix it with some water, then stir until evenly distributed. Apply a turmeric mask to the acne-prone area and let stand until the turmeric mask dries. Wash skin with clean water and dry it immediately. For maximum results, use this turmeric once a day on a regular basis. In addition to turmeric, ginger is a traditional spice ingredients that are very useful to remove acne. Curious? Here are the benefits of ginger for acne. Ginger contains many useful compounds such as shogaols, gingerols, and others that will be useful for curing the acne and recurrence of severe acne. Ginger contains many vitamins and minerals that will be beneficial to improve skin health in general and trigger the production of new skin cells to replace dead skin cells. Prepare 3 pieces of ginger, then mashed or puree into a blender. Do not forget to add a little clean water. Apply a ginger mask that is smooth to the area of acne skin. Let stand for 10 minutes and wash the skin using clean water and dry it immediately. For maximum results, use ginger mask once a day on a regular basis. Well, that's the various acne herbal remedies that will be very useful to get rid of acne in a very short time. Do not forget in addition to using herbal medicine above, you also must apply a healthy way of life to avoid acne. Hopefully this article useful for you.